The Bureau of Labor Statistics projects computer and information technology occupations to increase by 12 percent through 2024. With a range of career opportunities in the field, an online computer science bachelor degree is designed to help you develop the skills you need to pursue a meaningful and rewarding career in your field of choice. In computer science, you’ll cover a range of core topics, including computer science principles and web programming. From there, you can either pursue a concentration — such as software development or artificial intelligence — or round out your degree with electives, depending on the curriculum requirements at your school. With such specialized study and a high demand in the field, students are generally able to tailor a computer science degree to fit their professional goals. Computer science graduates generally have no problem finding a job in the field after school, and often work in computer programming, data analysis, and software development. The best online bachelor’s degrees in computer science blend a rigorous curriculum with the flexibility inherent in distance-based education. Online programs are convenient for working professionals and learners who are otherwise too busy to commute to campus for classes each day. Distance courses are generally taught asynchronously, which allows students to consume lectures and complete assignments at their convenience. A crucial component to student success in these programs is diligence: despite the flexibility, classes and assessments are just as difficult online as they are on-campus, and students must be motivated and disciplined to succeed. Below, we have ranked the top 20 online computer science programs in the country. Our methodology incorporates a variety of factors, including affordability, return on investment, graduation rate, student-teacher ratio, among other pertinent metrics. Each program on the list has comparable student-teacher ratios and affordable tuition prices. Additionally, each program offers a variety of concentrations within their computer science department, and every school on our list boasts excellent graduation rates. The University of Florida -- Online provides engaging and cutting-edge online degree paths for students around the world. The school's affordable online computer science degree serves as an example of its commitment to academic excellence. Combining theoretical foundations of computation with more practical knowledge of career preparation, the program produces graduates who move into roles as business intelligence analysts, computer programmers, database administrators, and information systems developers. Many also go on to graduate studies in computer science to qualify for senior or managerial positions. Lower-division applicants to UF -- Online's computer science degree must have earned between 12 and 59 credits with at least a 2.5 GPA, while upper-level applicants should have 60 or more credits and meet the same GPA standard. All prospective students should have completed coursework in geometry and calculus. Located in Kansas, FHSU has provided quality education since 1902. However, only recently did the school establish a computer science department and begin offering its computer science degree online shortly after. The creation of the new department allowed for the synergizing of professors from numerous fields and the development of innovative and interdisciplinary coursework. Within this 124- to 129-credit program, distance learners can choose from six different concentration areas: business, mathematics, geographic applications, physics, technology studies, and networking. Alumni find professional success at federal agencies such as the National Laboratories or Office of the Director of National Intelligence, and at private companies such as Google, Facebook, Cisco, Cargill, and Boeing. Students on a budget can take advantage of a respected yet cheap education at FHSU; tuition for all distance learners is the same, regardless of their state of residency. The second largest campus within the UMass system, Lowell serves nearly 20,000 students annually. Many of these students complete individual courses or even full degrees entirely online, including the school's online computer science degree. Depending on the concentration, the program requires 120 to 121 credits. Concentrations available fully online include bio-cheminformatics and data science. The former combines biology and chemistry to help students learn how to use relevant tools for the disciplines, while the latter focuses on big data and how to extract useful findings from large volumes of information. All distance learners in these programs also complete an automatic mathematics minor through required coursework. The department offers a combined BS/MS in computer science that students can complete in five years. UMass Lowell commits itself to providing affordable learning options, requiring all distance learners to pay the same cost per credit. Earning a computer science degree online should be an enlightening and engaging education for distance learners, and the Greensboro campus of UNC works to ensure that every student enjoys this experience. Consisting of 122 credits, this interactive degree path grew from 131 declared majors in 2008 to 308 by 2013. Courses in the curriculum cover topics like the beauty and joy of computing, elementary data structures and algorithms, and ethics in computer science. Distance learners can rest assured knowing that they're enrolling in a program that has withstood the rigors: the Computing Accreditation Commission of the Accreditation Board for Engineering and Technology provides full accreditation for both the campus-based and online programs. Motivated students with high academic marks may elect to complete the Disciplinary Honors Program in Computer Science, which includes enhanced computer science courses and results in a corresponding honors designation on the student's academic transcript. UI -- Springfield boasts dedication to combining cutting-edge technology with rigorous educational programs. This includes the school's online computer science degree. Focusing on both software and hardware, distance learners delve into programming, software testing, design principles, programming languages, UNIX-based computers, and computer architecture as they complete the required 121 credits. In addition to completing a software engineering capstone that requires students to participate in the software life cycle, degree candidates can participate in internships to gain practical work experience. The department also offers a BS in information systems security for students aspiring to roles in data and information security positions. Online applicants to either program should have completed coursework in Java programming, calculus, and statistics, and must have earned at least 30 undergraduate credits with a GPA of 2.0 or above. The College of Information Science and Technology delivers UNO's computer science degree online, a 120-credit program featuring concentrations in internet technologies, information assurance, information systems, mainframe computing, telecommunications, computer networking, data/knowledge engineering, software development, and game programming. Designed for applicants with little to no prior experience in the field, the curriculum offers foundational knowledge of common theories and commonly used applications. Campus-based and online students alike may participate in the school's chapter of the Association for Computing Machinery or apply to be on a team headed to the annual International Collegiate Programming Contest. UNO welcomes transfer students to the degree, provided they complete 30 of the required upper-level credit hours at UNO. In completing the program, distance learners earn the first computer science undergraduate degree in Nebraska accredited by the Computing Accreditation Commission. UWF's Hal Marcus College of Science and Engineering oversees a multidisciplinary online computer science degree featuring a range of minors, concentrations, and certificates. Computer science majors may elect to complete minors in computer information systems or information technology, and the school offers a concentration in cybersecurity for students who want to be on the frontlines of protecting data assets and securing systems and networks against potential threats. Courses in UWF's computer science program include theory of computation, linear algebra, and database systems. DSU focuses on providing meaningful studies at affordable prices. The school's commitment to individualized learning results in small, intimate classes that allow for more focused teaching. DSU's 120-credit computer science degree online does not offer specialized tracks; rather, the program centers on providing general foundational skills and knowledge to help graduates succeed no matter their chosen path. The curriculum covers subjects like parallel computing, assembly language, and structured systems analysis. Students with exceptional academic records can take advantage of the university's computer science honors program, housed in the Center of Excellence in Computer Information Systems. Additionally, DSU welcomes all distance learners to participate in a range of student organizations, including the Computer Club and the Gaming Club. The school offers a range of computer science scholarship and grant opportunities to students seeking ways to make the program more affordable. Maintaining campuses in both Puerto Rico and the contiguous United States, PUPR offers degree candidates opportunities for exciting study abroad experiences, even if they're completing degrees online. Unlike many other schools providing an online computer science degree, the university's School of Engineering and Computer Science also features a bachelor of arts program for students looking to focus on more humanities-based courses. The BA path requires 121 credits, while the BS requires 123 credits. Some of the courses comprising core major requirements include object-oriented programming, database systems, assembly programming language, and design/analysis of algorithms. Most distance learners complete the degree on a full-time basis and graduate within four years, but the school provides accelerated options through the Blackboard Learning Management System (LMS) for students who want to graduate more quickly. Additionally, PUPR features an honors program that's open to computer science students who maintain a high GPA and are seeking a higher level of academic rigor. OU's Gallogly College of Engineering and Computer Science features a broad-based and flexible computer science degree online. Comprising 120 to 121 credits, the general track includes 14 courses in computer science fundamentals, nine courses covering required mathematics (including calculus), and three courses in natural science and physics. Aside from other general education requirements, students also complete three electives in senior-level computer science courses. The College offers an accelerated BS/MS dual program for students who wish to pursue graduate study. While OU doesn't require any visits to campus for distance learners, those who travel to the Norman location can take advantage of a cutting-edge studio with state-of-the-art software and hardware tools. Additionally, the computer science department features a number of research groups in areas like computational science, algorithms, theory, software engineering, and intelligent systems. OU's program boasts accreditation by the Computing Accreditation Commission of ABET. Based in Virginia, ODU has offered distance education programs for more than 30 years. The school provides a fully online computer science degree focused on broad theory, experimental techniques, engineering methodology, and strong laboratory components for students who want to be leaders in this dynamic field. The curriculum provides hands-on learning experiences, helping students gain a strong sense of concepts within the field and preparing them for meaningful roles in software engineering, network administration, database development, application programing, and system design. The program requires 120 credits, but transfer students need only complete 30 of those credits at ODU to qualify for graduation. The university delivers courses in both a synchronous and asynchronous format. Out-of-state distance learners pay only slightly more than their in-state counterparts, making this a cheap option for cost-conscious students. GSW's School of Computing and Mathematics emphasizes scholarship, community service, and creative problem-solving in all its programs, including a computer science degree online. After completing a liberal arts general education core of 61 credits, students enroll in 59 credits of major courses and electives. These courses cover a variety of topics, including data structures, computer architecture, design of operating systems, and software engineering. Students complete a capstone class taken during their final semester, in which they use all the skills and knowledge they've gained throughout the program to develop a comprehensive software design program. Additionally, internships facilitate real-world experience to help degree candidates build skills and take advantage of networking opportunities. Bachelor's degrees typically take four years to complete, but the department also provides a three-year plan of study for motivated learners. UMD's College Park campus operates one of the largest computer science departments in the country, with more than 2,800 students currently enrolled in online computer science degree programs. The Brendan Iribe Center for Computer Science and Innovation serves as the cornerstone of the department's academic programs, with studies ranging from networking systems and programming languages to algorithms and virtual reality. The computer science program, established in 1973, also organizes a range of events, including hack-a-thons, socials, career fairs, and tech talks that are broadcast live for distance learners. Some of the student clubs available include the Association of Women in Computing, Cybersecurity Club, Mobile Development Club, Game Development Club, and the Computer Science Daemons. Undergraduates can apply for more than a dozen departmental scholarships -- both campus-based and online -- to make this degree even more affordable. According to recent survey data, 100% of recent graduates of UW -- Stout's online bachelor of science in applied mathematics and computer science were either employed or pursuing continuing education within six months of graduation. 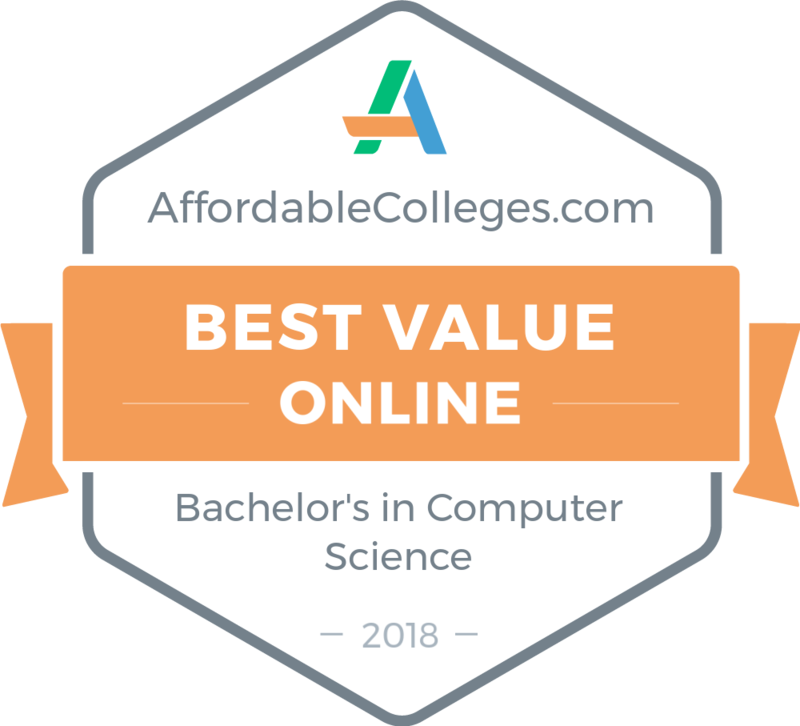 In addition to general education and core major studies, the computer science degree online offers a number of concentrations, including actuarial science, business management, cyber security, interdisciplinary studies, mathematics education, scientific computing, and software development. Most of these paths consist of 120 credits, and include a cooperative experience so students can gain hands-on knowledge of how their studies will be used in the real world. While it employs qualified faculty with experience and knowledge of the field, the department also features a variety of valuable resources, including individual libraries for computer science and information on a range of professional associations in the field that offer student memberships. A private institution located in Denver, Colorado, Regis offers uncommon learning opportunities as one of only 28 colleges in the United States operating from a Roman Catholic Jesuit heritage. Students receive a rigorous education in their subject area while also learning what it means to be a socially conscious, service-minded leader in their personal and professional lives. The university's ABET-accredited online computer science degree exposes distance learnings to wide-ranging theories and practices with the goal of producing competent, compassionate graduates who are prepared for any professional challenge. Enrollment of online students in this program has grown exponentially in the last few years, with 330 new students during the 2010-2011 academic year and nearly 700 for the 2015-2016 academic year. The bachelor's degree requires 128 to 133 credits, while the combined BS/M.S. dual degree requires 152 credits. Located in a suburb of Baltimore, Towson's Department of Computer and Information Sciences delivers online bachelor's degrees in computer science, information systems, and information technology. All three programs prepare distance learners for leading roles in private, governmental, and nonprofit entities with a need for qualified technology specialists. The computer science degree online offers tracks in security and software engineering, while the information systems program provides concentrations in business, eGovernment, interface design, and systems. Towson administers its information technology degree as a generalist program, helping students become experts in infrastructure. The Computing Accreditation Commission of ABET accredited all three programs, and students can earn their degree in each by completing around 120 credits. A private institution, Towson provides generous financial aid opportunities in the form of scholarships and grants to help offset costs. Georgia's KSU has conferred degrees since 1963 and now serves more than 36,000 campus-based and distance education students. The surge in technological advances in recent years has grown the school's Department of Computer Science and its online computer science degree significantly, as more prospective students seek to further their educations in pursuit of in-demand careers. KSU's program emphasizes studies in computer systems architecture, data communications, software development, programming, and operating systems to produce well-rounded graduates. The 120-credit curriculum includes 47 credits of general education. As part of graduation requirements, all students complete a culminating senior project that allows them to display all that they have learned while at the university. KSU's program has boasted full accreditation by ABET's Computing Accreditation Commission since 2001. The university provides a variety of financial aid opportunities, including grants and scholarships, for undergraduate students. CWU's Computer Science Department aims to provide educations that graduates can use in modern businesses to help clients harness theories and methodologies to stay on the cutting edge of technology. The curriculum emphasizes the foundations of computer science, mathematics and engineering, in its online computer science degree. Distance learners move through a plan of study that exposes them to both foundational and advanced topics, including user interface design, web development technologies, and computer graphics. The required senior capstone course synthesizes all of the theoretical and experimental knowledge gained as students design a practical final project. Throughout the coursework, CWU focuses on six different areas of study: artificial intelligence, computer systems, information systems, scientific computing, software design/engineering, and web development. All together, this program consists of 106 credits. Currently, CWU cannot deliver distance learning content to students residing in Minnesota, Iowa, Missouri, Kansas, Arkansas, Alabama, D.C., and Maryland. GSU offers an online computer science degree through its College of Engineering and Information Technology. The program requires degree candidates to complete 126 credits, including four elective courses where students can focus their knowledge in a specific area of the field, such as cybersecurity, information technology systems, or gaming design. In addition to listing program outcomes, the department's website also outlines objectives for students three to five years after graduation. These include taking on successful leadership roles, remaining in the field, and making positive contributions to their companies and to the field as a whole. The program has boasted continued growth since its introduction as a degree path; during the 2015-2016 school year, 172 students declared this major. Admission requirements include acceptable grades in certain math and programming courses. OSU delivers an online computer science degree for students who have already completed a bachelor's degree in an unrelated field and want to merge existing expertise with new knowledge of computer science. Available entirely online, this 60-credit program propels interested learners into new careers while building on skills gained from prior undergraduate education. OSU offers plans of study for degree candidates seeking to finish the program within one, two, three, or four years. Students who pick the one-year track should enroll on a full-time basis. Distance learners can begin their studies at four different start points throughout the year. Online students in this affordable program all pay the same tuition rates, regardless of their location. Applicants should have earned a bachelor's degree with a minimum GPA of 2.25, and must submit a personal statement no longer than 200 words. Established in 1946 to serve thousands of GIs returning from war, today LeTourneau provides educations to students of all backgrounds and areas of interest at its Texas campus and through distance learning initiatives. The school offers an online computer science degree as a bachelor of science that emphasizes both practical experience and theoretical foundations. The degree's curriculum focuses on software development, with additional concentrations available in game development and network security. Some of the unique courses available, regardless of concentration, include data structures, computer architecture, digital electronics, and database management. As a university with Christian underpinnings, LeTourneau requires all students to complete 12 credits in theology and vocation courses. The computer science program consists of 126 credits, and typically requires full-time students with no previous academic credits to devote four years to earning their degree. SE's Department of Chemistry, Computer, and Physical Sciences features an online computer science degree and considers students who have already taken required general education courses or completed an associate degree at an accredited institution perfect candidates for the 58-credit program. The curriculum emphasizes the importance of well-rounded students who know how to solve problems, have a firm grasp on the theories and methodologies of the field, and dedicate themselves to engaging in lifelong learning of new theories and applications of computer science. Applicants should have completed coursework in calculus. Most students complete the program in one or two years of full-time study, covering topics ranging from advanced web-based application development and distributed networks to applied net-centric computing and discrete mathematics. SE provides a variety of financial aid opportunities, including loans and grants. Since 1932, Lewis has operated as a private college espousing Roman Catholic and Lasallian traditions from its location in Illinois. In recent years, the school has expanded its distance learning initiatives to include a computer science degree online. With a focus on cybersecurity, networking, programming, and problem-solving, the curriculum provides students with theoretical and practical skills needed to thrive in myriad positions within the field. The university's approach to education seems to be effective, as 100% of recent graduates found employment in computer science-related jobs within two months of graduation. Because Lewis offers the degree exclusively as an accelerated program, students typically complete all requirements within three years of matriculation and begin their careers earlier than peers in traditional programs. The university delivers all courses asynchronously and entirely online using the Lewis University Computer Science Cloud, an innovative platform providing 24/7 access to virtual machines that allow students to complete hands-on programming exercises. Located in Pennsylvania, Misericordia's 124-credit computer science degree online focuses on ensuring that graduates leave with all the foundational knowledge they'll need to enter the field. Rather than offering preset concentration areas, the department provides six free elective courses so students can effectively build their own specialization within the program. Some of the current electives available include web design and production, security management, physical security, disaster recovery, and independent study. To be eligible for admission, applicants must rank in the top half of their graduating class and/or have a minimum 2.5 GPA. They'll also need a combined 930 in critical reading and math on their SAT or a minimum score of 18 on the ACT. Other admission requirements include high school coursework in biological science, physical science, and mathematics. SPC serves as an excellent choice for students seeking options outside the traditional online computer science degree path. The school's program features six different tracks: computer information technology, computer networking, computer programming and analysis, cyber security, technology development and management, and web development. These wide-ranging options make it possible for distance learners to find a path suited to their future goals while also taking classes from other tracks to endow themselves with comprehensive knowledge of the field today. SPC's computer science department works with Florida State University to provide a fully online bachelor's degree in computer science for students seeking a more traditional program. While Florida residents do pay less in tuition than their out-of-state counterparts, the college offers a truly impressive array of scholarships, grants, ways to earn free college credit, and an interest-free payment plan. Saint Leo University seeks to ensure that prospective students realize its computer science degree online program stands on the frontlines of innovation, progress, and change. Students at Saint Leo benefit from experienced professors, feeding off their excitement about the future of technology and courses that incorporate the latest advancements. In addition to covering foundational topics such as computer systems and database programming, learners also get to delve into advanced studies of programming logic, computer forensics, and network defense. Those interested in forensics can take advantage of an available specialization in information assurance, and the university provides internship opportunities for students looking to get their foot in the door. Additionally, Saint Leo features the Omicron chapter of Upsilon Pi Epsilon, an international honor society for students who distinguish themselves in the fields of computing and information systems. The largest Christian university in the world, Liberty currently serves more than 100,000 online students through LUOnline, its distance learning arm launched in 2009. The university's School of Engineering and Computational Sciences provides a fully online computer science degree for those looking to further their education from the comfort of their home. In addition to completing general education and major requirements, learners can choose to specialize their degree to deepen their knowledge in a particular area. Current options include cybersecurity, information security, software engineering, and web and mobile programming. The majority of faculty hold the highest degree in the field and all have experience in using their computer science training in a business setting. The Computing Accreditation Commission accredited Liberty's program, and the Accreditation Board for Engineering and Technology accredited the university's computer science department. Because Tarleton is a member of the Texas A&M University System, students enjoy the support of a much larger conglomerate while benefiting from smaller class sizes and more personalized learning. Tarleton's Department of Engineering and Computer Science provides a four-year, 120-credit computer science degree online designed to meet the expanding need for qualified software engineers and embedded system programmers. An interdisciplinary program, the degree combines studies of programming languages, technology, and mathematics to produce well-rounded graduates. The majority of alumni work in corporate settings or progress to graduate studies. Students and faculty also conduct research, with past projects focused on game development, graphics, and autonomous robots. Other careers well-suited for graduates include positions as system analysts, gaming software programmers, geographic analysts, and operating system developers. Available resources for distance learners include online job boards, resume assistance, and career counseling. Students seeking a technically challenging degree that emphasizes their Christian faith should consider CBU, a comprehensive private institution located in Riverside. The school's computer science degree online emphasizes both programming and design while also introducing distance learners to the mathematical and algorithmic components of the field. Upon finishing their degree, graduates can write programs in numerous programming languages, apply mathematics that provide the cornerstone for computer systems, and understand how Christianity can influence the use of computing in a modern world. Alumni function in a range of exciting roles, including software developer, data scientist, computer science researcher, and technology writer. Degree candidates must complete a minimum of 32 credits of math and science coursework to qualify for graduation from CBU. Additionally, all students in the computer science program must complete an approved "cross cultural experience," which does not have to be for course credit. Located on the outskirts of Dallas, UNT began as a teacher's preparation college but today functions as a large public research university. Students electing to complete a computer science degree online at UNT enjoy opportunities to participate in meaningful projects that create lasting ripples within the discipline. The BS curriculum prepares distance learners who plan to pursue graduate studies for the rigors of advanced education. To finish the program, degree candidates must complete at least 121 credits, including a senior thesis and a computer science capstone. Laboratory science classes comprise 16 of the required credits, and include studies in mechanics, electricity, magnetism, and wave motion. Students must earn a GPA of 2.75 or above for all advanced computer science courses. UNT delivers online course content using the Blackboard LMS. Park has provided meaningful educations to thousands of undergraduate learners since its inception in 1875; that mission continues today in both campus-based and distance learning programs. The school's online bachelor's in information and computer science helps distance learners prepare for a variety of careers within the industry, as well as graduate studies. In addition to completing coursework in general topics, degree candidates may opt to specialize in computer science, software engineering, data management, or network and security protocol. The 59- to 66-credit program consists of 36 to 38 credits of information and computer science core courses in addition to 23 to 28 specialization credits. Prospective students applying to this online computer science degree should have already completed all general education and prerequisite requirements or earned an associate degree from an accredited institution. All distance learners at Park pay the same tuition, regardless of their state of residence, and the university offers discounted rates for veterans and members of the military. Located in California, Pennsylvania, CUP operates as a public university serving nearly 10,000 students annually. The school's computer science degree online introduces students to the theories and hands-on practice they'll need to thrive in a world of new technologies and ideas. Small class sizes allow for individualized learning, while dedicated and experienced faculty function as both teachers and advisors. The curriculum consists of 120 credits that full-time students typically complete in eight semesters. A senior project during the final term allows distance learners to synthesize all they've learned in a final project that can be leveraged in pursuit of future employment. CUP does not require degree candidates to complete internships, but does encourage semester-long programs in the third and fourth year of the curriculum. Additionally, distance learners can participate in the school's student-led Computer Club to sharpen their skills and gain contacts within the industry. Offering a slightly different take on the traditional online computer science degree, UT delivers an online bachelor's in computer science and engineering that prepares students for roles necessitating in-depth knowledge of circuits, electronics, signals, and systems. The program includes general studies of the field, such as programming languages and software development, while also emphasizing engineering and mathematical skills necessary for success. As part of the required 120 credits, degree candidates complete four cooperative experiences to build real-world skills and prepare for employment after graduation. Additionally UT students can benefit from membership in a range of student clubs, including the Association for Computing Machinery, Rockets Open Source Initiative, and Triangle, a Greek fraternity comprised of students majoring in related subjects. All distance learners pay the same tuition, regardless of where they live. Students enrolled in Davenport's online computer science degree enjoy a variety of ways to customize the 120-credit program. The curriculum covers five areas: foundations of excellence (37 credits), foundations of technology (18 credits), major requirements (42 credits), open electives (23 credits), and a specialty area (12 credits). Available concentrations include biometrics, computer architecture and algorithms, gaming and simulation, and mathematical modeling. Davenport welcomes transfer students into the program, granting credit for prior certification, professional roles, and life experience. The university maintains a low student-to-faculty ratio in all classes and ensures that busy students have the flexibility they need to succeed. One of the more affordable options available, Davenport awards an average of $15 million in scholarships and grants at the start of every academic year. Additionally, the university provides a range of financial aid opportunities, including scholarships, student employment, and student loans. A member of the Texas State University System, Lamar operates as a public research institution providing degrees from the baccalaureate to the doctoral level through both brick-and-mortar teaching and distance learning initiatives. The school delivers an affordable computer science degree online with a curriculum focused on applications of computer architecture, computer science, database multimedia, data structures, information systems, theory of programming languages, and software engineering. Of the required 120 credits, degree candidates complete 48 in computer science, 20 in mathematics, 12 in laboratory science, and the final six allow students to complete free electives. Lamar does not require students to participate in internships, but many elect to complete semester-long placements to gain experience and make contacts in the industry. Distance learners may enter the program during the fall semester and typically require four years to earn their degree. Recently accredited by the Accreditation Board for Engineering and Technology, USC -- Upstate's computer science degree online requires distance learners to fulfill 120 credits. In addition to general education requirements, students complete a four-semester foundation sequence including seven upper-level courses, 12 credits of laboratory science, and 18 credits of mathematics (including three semesters of calculus and a statistics course). The university features a Computer Science club, a student-led organization that meets twice each term to discuss emerging technologies, participate in leadership development initiatives, and welcome notable speakers. Online students can participate via webcam. Although out-of-state degree candidates pay more than resident learners, the program offers relatively cheap rates. The university's Outstanding Computer Science Student Award also helps offset tuition and fees. USC -- Upstate permits students to transfer a maximum of 76 credits from a junior college or two-year college toward their degree. Additionally, learners can earn up to 30 credits for educational experiences in the military. Ohio U's School of Electrical Engineering and Computer Science recently received a major endowment from an electrical engineering alumnus. In part due to this generous gift, the school delivers one of the most cutting-edge online computer science degrees available today. This 120-credit, affordable computer science program seeks to instill three lifelong values in every graduate: theoretical, practical, and professional knowledge; the drive and ability to stay current with new developments; and the professionalism and ethics necessary to take on advanced roles throughout their careers. Transfer students must demonstrate a 2.0 or higher GPA in math, chemistry, and physics coursework. Upon leaving the program, graduates have found success in meaningful roles at internationally recognized companies and organizations, including Amazon, Expedia, Google, Microsoft, Boeing, and the National Security Agency. Ohio U's cheap program is great for cost-conscious learners, and costs only $3 more per credit for out-of-state students. GMU's Department of Computer Science offers two different online computer science degree paths: a BS in computer science, and a BS in applied computer science. The latter provides specialized education for distance learners who want to apply computer science in other disciplines to create innovative approaches. Additionally, the applied science program features concentrations in the areas of bioinformatics, computer game design, geography, and software engineering. GMU's general computer science degree provides a foundation for success in the field and permits students to complete eight credits of free electives. Because the school sits close to Washington D.C., students can participate in meaningful internships or find fascinating jobs within the U.S. government. In addition to the support of an individual advisor, online learners also benefit from library services, a writing center, and technical support. Duquesne's Department of Mathematics and Computer Science offers distance learners the chance to earn a BA or BS in computer science completely online. Students seeking a more traditional liberal arts education typically gravitate toward the BA, while those who want to delve more deeply into technical topics complete the bachelor of science. Each takes approximately four years to complete. The BA requires 33 credits in computer science courses, while the BS requires 40. Some of the innovative courses currently available include algorithmic thinking, Java with data structures, digital logic, computers and humanity, and artificial intelligence. Degree candidates complete a senior project during the final semester, either individually or as a group, that requires a significant programming component, proper documentation, and an extensive report on topics of interest within computer science. Duquesne provides distance learners earning their online computer science degree with a variety of resources, including peer tutoring, one-on-one mentoring by faculty, involvement in faculty research, and the opportunity to enroll in specialized courses through cross-registration at either Carnegie Mellon University or the University of Pittsburgh. SUS Online functions as the distance learning arm of Southern University and A&M College, a historically black institution established as a public land grant university in Louisiana in 1880. More than 6,000 students currently attend, many taking distance education courses or completing their entire degree online. SUS Online's computer science degree online provides students with strong foundations in computer science and related disciplines to ensure they have the skills and knowledge necessary for professional success in the field. Graduates hold a variety of positions, including roles in business, government, education, and industry. SUS Online makes the program available to first-time freshmen, homeschooled applicants, transfer students, and working professionals. For credits to be eligible for transfer toward a degree, they must be both relevant to the subject and must have been earned at an approved institution with a final grade of "C" or higher. Located in New York, Mercy devotes itself to producing innovators in various industries. The school's 120-credit, online computer science degree, housed in the college's School of Liberal Arts, provides students with the skills they need to be competitive in the job market. General education comprises 60 credits of the curriculum, while the major requires 47 additional credits. Mercy allots 13 credits for open electives, allowing degree candidates to focus on a particular facet of the field, such as Linux administration, disaster recovery, or cryptography. Full-time distance learners typically complete the program in four years through asynchronous coursework, but Mercy permits students to transfer up to 75 credits from a two-year institution or 90 from a four-year institution. Resources available for online students include academic advising, and online learning center, and career services. A public institution based in Savannah, Georgia, Armstrong strives to meet the dynamic needs of the computing industry. The school's online computer science degree helps launch students into meaningful, high-paying careers. The major requires 54 credits of computer science courses, supplemented by five courses in mathematics, four courses in science, and a class in technical writing. Degree candidates must complete a precalculus class before beginning any computer science coursework covering topics like numerical analysis, data mining, handheld and ubiquitous computing, and artificial intelligence. Accredited by the Computing Accreditation Commission of ABET, Armstrong's program features small, personalized classes and opportunities for distance learners to gain experience inside and outside the virtual classroom. In order to graduate, all degree candidates must take a major field test and final examination. Graduates of UMUC's affordable, online computer science degree function in high-powered roles as application software designers, system analysts, programmers, and software architects. The 120-credit curriculum emphasizes programming and algorithm optimization in addition to the theories, sciences, and math behind modern computing. UMUC bills itself as transfer-friendly, permitting students to transfer up to 90 curriculum-eligible credits completed at an accredited institution toward their computer science degree. Degree candidates looking to get more involved in computer science at UMUC can join the student-led Computing Club or apply for membership to Upsilon Pi Epsilon, an international honor society for high-achieving students earning degrees in computing and information disciplines. Cost-conscious distance learners can take advantage of cheap tuition rates and a full range of scholarships. Additionally, UMUC offers discounted tuition for military members and their spouses. Located in Ohio, Franklin has exclusively educated nontraditional learners since its inception in 1902 and continues its mission to provide accessible degrees to that population today. The school's computer science degree online degree features two options for distance learners: the traditional BS in computer science prepares students for entry-level roles in various industries, while the "subsequent" BS program caters to students who have already completed an undergraduate degree in an unrelated subject and are now looking to change careers. The former program requires 124 credits, while the "subsequent" degree requires only 60. Degree candidates seeking networking and job opportunities can join the student chapter of the Association for Computing Machinery, which maintains an active chapter at Franklin. The computer science department offers a range of merit and need-based scholarships to make this program cheaper. South Carolina's Limestone delivers an online computer science degree with an emphasis in computer and information systems security for students who want to defend against cyber threats or attacks. Full-time students typically complete the 123-credit program within four years. Some of the courses in the concentration include cryptography and access control, information security and risk management, and disaster recovery planning. Degree candidates also complete a senior capstone wherein they synthesize their newly acquired knowledge in a large-scale research project. Upon completing the curriculum, students can take a number of certification exams, including those for Certified Information Systems Security Professionals and the International Association of Computer Investigative Specialists. Limestone boasts leaders in the field as faculty, each of whom gained significant experience before moving into the teaching profession. A military-friendly college, Limestone enables active service personnel and veterans to get a cheap degree by offering them a tuition discount of nearly 50%. Columbia offers an online computer science degree in the form of a bachelor's in computer information systems (CIS) that includes a liberal arts education alongside studies of nuanced topics in computing. The 120-credit program consists of general education requirements (38 to 41 credits), core major requirements (41 to 42 credits), computer information systems electives (18 credits), and various electives (16 to 20 credits). Degree candidates complete a senior seminar during their final semester that serves as a culminating evaluative class all CIS students must pass to graduate. Columbia divides its academic year into six eight-week sessions, rather than traditional semesters, to help motivated learners earn their degrees more quickly. Student organizations include the Computer Science Club and the Upsilon Pi Epsilon Computer Science Honor Society. In an effort to provide a cheap, yet esteemed, online degree, Columbia does not charge extra fees for out-of-state distance learners. A private institution located in Michigan, Baker provides career-focused bachelor's degrees both on campus and online. In concert with industry professionals and leaders in the field, the school developed an online computer science degree incorporating coursework, hands-on learning, and field-based experiences. The major consists of 127 credits and includes studies in SQL, net-centric computing, C# programming, trigonometry, and programming for mobile devices. The curriculum focuses on ensuring that graduates leave the program with the computing and mathematical underpinnings necessary for professional success in a variety of roles. In addition to access to individualized advising, each student also has the opportunity to work with a career coach to prepare for employment upon graduation. The field experience component provides valuable real-world knowledge, opportunities to make contacts in the industry, and critical work training to boost resumes. An exclusively online institution, IU boasts uncommonly in-depth knowledge of the intricacies of distance education. The university's programs feature considerable flexibility, permitting students to choose from many different start dates throughout the academic year and to finish programs at an accelerated pace if they so choose. For example, distance learners can earn their computer science degree online in as few as 36 months. IU's BS in software and mobile applications development produces graduates with competitive positions in the ever-expanding software and applications market. With a focus on adhering to a well-rounded plan of study, IU requires students to complete a range of programming and applications development courses alongside entrepreneurship and business classes. A transfer-friendly school, the university allows students to save up to 75% on the time and cost of earning their bachelor's degree by earning credit for previous college coursework or qualifying military experience. CSU's Computer Science Department aims to cultivate intelligent, proficient, and highly ethical leaders within the world of computing. The department delivers a number of different online programs, including a BS in computer science, a BA in computer and information sciences, and a bachelor of technology in computer science. While the online computer science degree follows a traditional curriculum, the B.T. caters to students who have already completed an associate degree in a related field and now seek to bolster their employability by furthering their education. Both full degrees, the BS and the BA each require distance learners to complete around 121 credits. The Computing Accreditation Commission of ABET has fully accredited all three programs, and each provides numerous opportunities for students to gain practical experience to complement theoretical knowledge. DU's Daniel Felix Ritchie School of Engineering & Computer Science administers a 121-credit BS in computer science. Heavily rooted in the study of mathematics, the curriculum includes an automatic math minor. Standout topics include programming language structure, algorithm expression, and solutions-oriented studies of applications. DU encourages high-achieving degree candidates to apply for its University Honors Program, which provides opportunities for more in-depth learning in a smaller community of dedicated students. Additionally, the school promotes study abroad opportunities through its Cherrington Global Scholars Program. Cost-conscious students can apply for the annual departmental computer science scholarship. The university offers other forms of financial aid, including grants and other need-based scholarships. All distance learners earning their computer science degree online pay the same tuition rates, regardless of their state of residence. ABET's Computing Accreditation Commission has fully accredited DU's computer science degree.